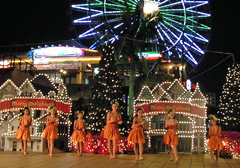 Night-time illumination has started at the American Village in Mihama, Chatan. It will run until the end of February 2014. Visitors can enjoy the decorations during the day and a spot for taking photographs has been set up in front of the Ferris wheel. The opening ceremony attracted many people who enjoyed an ocarina performance and a hula dance show (see photograph).